I have googled a bit but was never able to find an answer. What should be my first approach to simulate a video and audio noise from TV on screen? I mean, when my TV antenna is removed but the TV is still on (like they show in Japanese horror movies sometimes). I can use ffmpeg or any other technique but what is the simplest possible form of the signal? Note that this will create black and white video noise. This will create color video noise. If you just want black and white you can add the hue filter. This bitstream filter can accept a value to increase or decrease the amount of noise. It's inverse, so a higher number is less noise, and 1 is the lowest number and therefore the most noise. You will need to experiment to see what works best for you. This seems to work well with rawvideo or huffyuv for video, and pcm_s16le for audio, but I recommend experimenting. 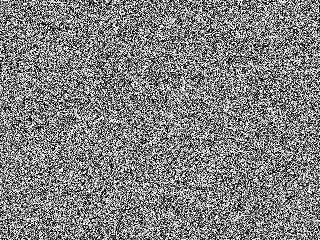 See lossless vs corruption (notes) for a video showing how different encoders react to noise corruption. 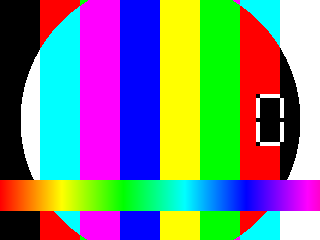 See the H.264 and AAC encoding guides on the FFmpeg Wiki for more encoding info. Increase -q:v value to ~20 if you want a more "encoded" look. Add a noise value as shown in the section above if you want more noise. See the section above for more info on the noise bitstream filter. Results may vary, so you may not get what you're looking for. See hex editor method below. You can lie to ffmpeg and make it think that the colorspace and chroma subsampling is different that it actually is resulting in strange, error-like effects. Note the frame rate and video frame size. Refer to ffmpeg -pix_fmts and choose one of the available formats such as yuv420p16le. The -framerate and -video_size values were copied from the original input file information shown in the console output of step 1. Of course you can also manipulate these for various effects. By the way, the source can be further optimized to gain ever better speeds. Not the answer you're looking for? 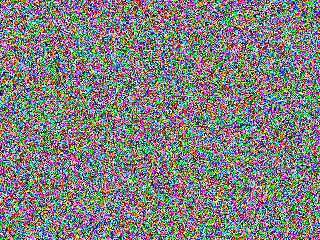 Browse other questions tagged ffmpeg noise tv or ask your own question. How to apply light noise on video? How to avoid audio sample 16bit clipping after equalization?